I’m not going to lie: shopping for a new bra excites me. I could spend hours browsing different styles and materials online. Most of the time, however, I end my search without ever buying anything. Because I suffer from serious buyer’s remorse, I usually talk myself out of purchasing. However, one brand got through to me. I bought my favorite bra from Lively after watching a captivating Instagram ad. There were a few key reasons I responded to the Lively ad I saw on Instagram. First, the sophisticated color palette caught my eye. As I stopped mid-scroll to examine the ad, the casual tone of voice appealed to me. Reading the caption, the highlighted benefits, testimonials, and offers sealed the deal. Every woman has her own color preference when it comes to intimate wear. I for one have never been a huge fan of hot pinks or garishly bright colors. I like the subtle, muted tones of peaches, pinks, greys, and blacks. 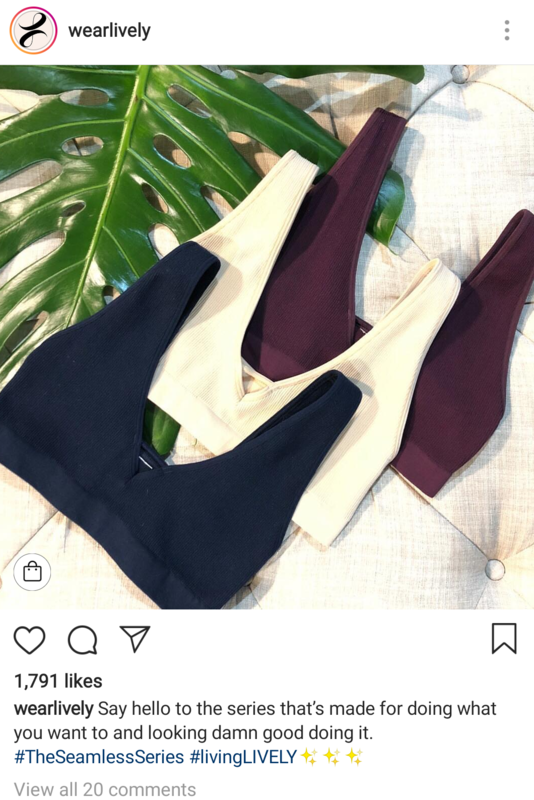 If you visit Lively’s Instagram profile, you’ll see that the brand not only has products that primarily consist of those colors, but all of its ads and photographs match the colors for one cohesive, stylish palette. 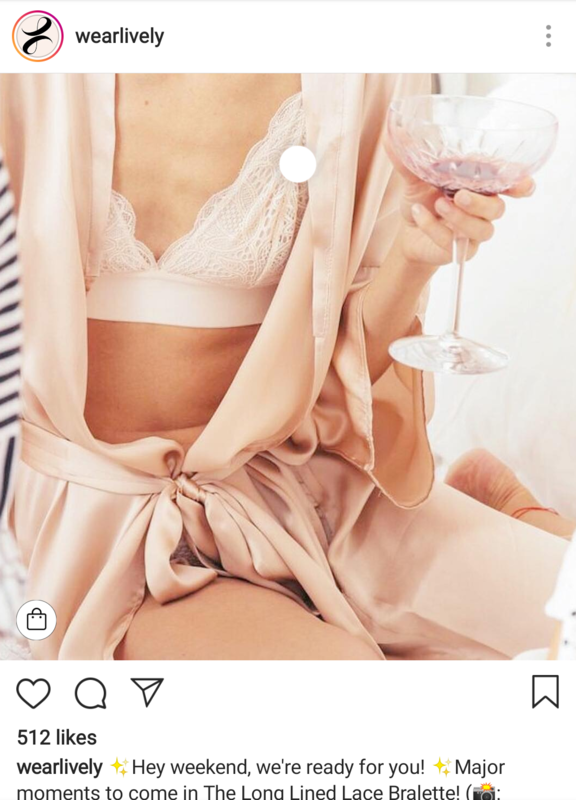 Rather than featuring one of the brand’s light pink bras in a photo, Lively also features a model wearing a similarly toned peach robe while holding a glass of pink wine. The photo matches the brand’s style and color palette to reinforce branding. Maintaining a single color scheme isn’t a tactic unique to Lively. In fact, it is a practice many Instagram influencers employ. Among those influencers is fashion and lifestyle blogger Noelle Downing (@noelledowning) who says in an article by Huffington Post that she uses orange and rust tones as her consistent color scheme because they perform better. Toronto lifestyle blogger Joelle Anello (@lapetitenoob) also expressed the impact of a consistent color scheme and aesthetic in her success on Instagram in a Page Cloud article. She maintains pink hues and complementary colors across all of her images. I like a nice push-up bra that doesn’t over enhance but gives me just enough umph. 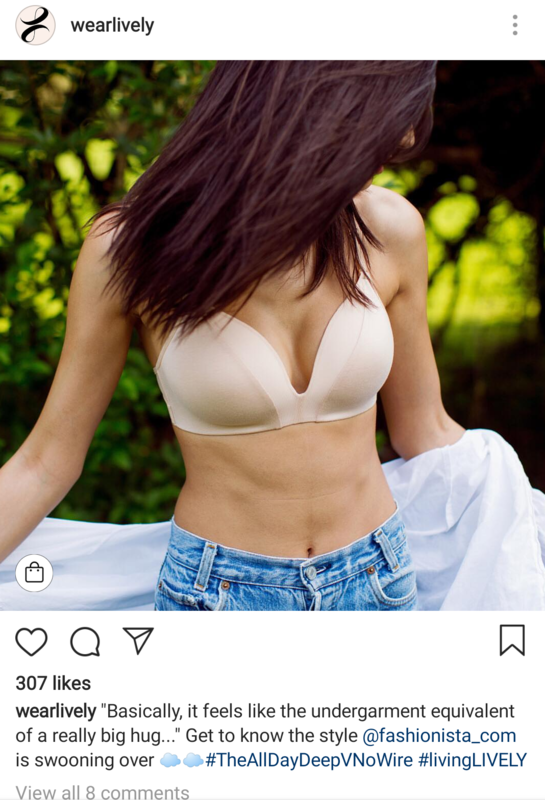 Lively’s Instagram ads stood out to me because they highlighted the comfort of their push-up bras without the underwire. To support its claims, Lively’s video ads showed models exhibiting the bra’s astounding results. By clearly highlighting the benefits of the product and demonstrating it in use, the Lively ad got me to stop mid-scroll and visit the online store. The strategy Lively employed that compelled me to purchase is called value proposition, the benefit Lively’s products give to customers. This strategy appears nearly everywhere. For example, Google uses value proposition when marketing Google Drive to its audience. Its ads state simply “A safe place for all your files,” communicating to customers that they get secure and large storage space when they use Google Drive. Workplace productivity and messaging app Slack also uses effective value proposition, promising to make “working lives simpler, more pleasant, and more productive.” This kind of marketing message helped the company generate a $3.8 billion valuation. These are only some examples of brands using value proposition to reach its audience. Many of Lively’s Instagram ads and posts have captions that include testimonials from real customers that made me feel like I could trust the brand to deliver quality products. After all, people like me bought, tried, and tested the product. If they loved it, so will I. Normally I would research the brand for reviews, but since they are included in the ads and posts, I didn’t need to spend more time doing that. Lively brought that information to me. 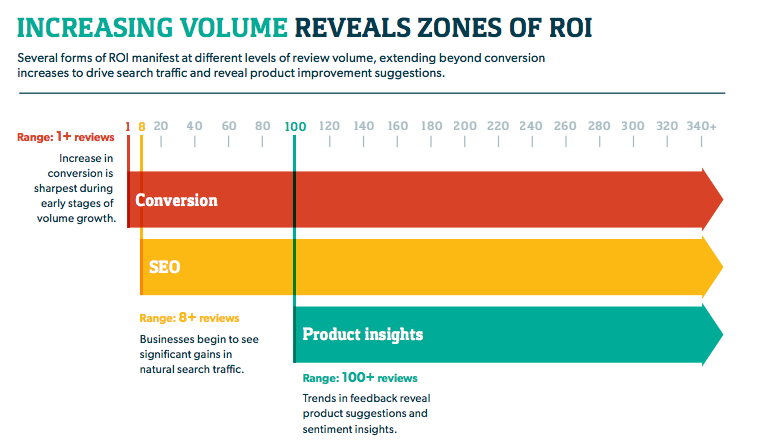 Increasing review volume leads to higher conversion rates. Product-specific review content drives search traffic and keyword rankings, specifically when a business earns 10 or more reviews, resulting in 15 to 20 percent increase in search traffic. Three- and four-star reviews contain two times as many product suggestions as others. Testimonials are so effective because consumers desire social proof, says Content Marketing Institute. Nothing says “thank you for buying” better than promotional perks. Lively consistently does so through its Instagram ads, making the temptation to purchase even stronger. The brand often offers a free tote bag with every purchase made during a promotional time period. This not only gives buyers extra incentive, but it also creates a sense of urgency. Promotional offers are a hit with customers. Zee Dog, a company that connects dogs and people through its pet products, used Instagram Stories and video ads last year to reach customers during Black Friday. During the second stage of the campaign, the company announced the products that were running out and reminded customers that the Black Friday deals were expiring soon. As a result, Zee Dog more than doubled sales compared to the previous Black Friday season. A casual tone of voice doesn’t work for every brand, but it works for Lively. In many of its Instagram ads, Lively uses bold language that regular people like me can relate to. For example, in one ad, the caption says “Say hello to the series that’s made for doing what you want to and looking damn good doing it.” In addition to being relatable, this tone is empowering and confident, making a shopper like me want to buy a product that makes me feel that way. Marketers have found more success in sounding conversational in their social media ads than sounding salesy. According to a Forbes article, being conversational, for example, being humorous, can help differentiate your brand. In other words, the more relatable the tone of voice, the more trustworthy your brand is perceived by your customers. When my Lively box arrived in the mail, I was giddy with excitement. When I opened it, it didn’t disappoint. It felt carefully arranged just for me, and it exceeded my expectations for quality. 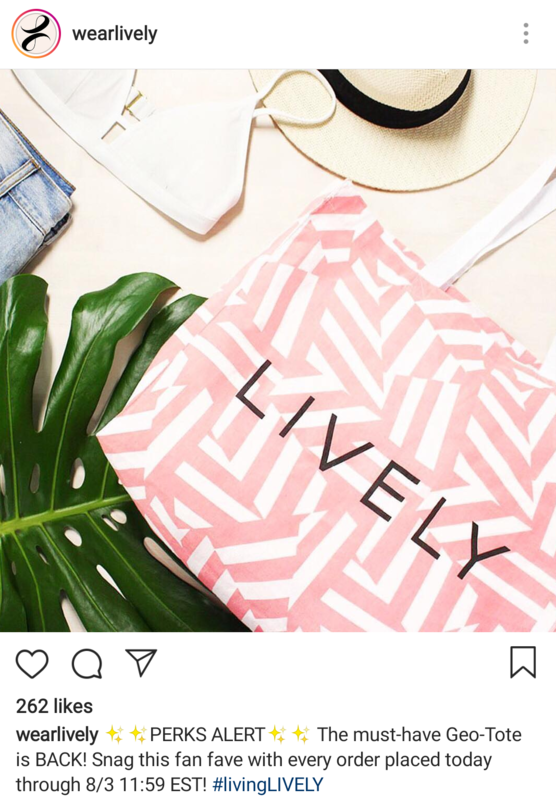 Instagram helped Lively build up that excitement to make me a loyal customer from that point on. Through elegant, colorful visuals, clearly stated benefits, upfront testimonials, and a relatable tone of voice that empowers, Lively was able to add another name to its customer list. No buyer’s remorse here!